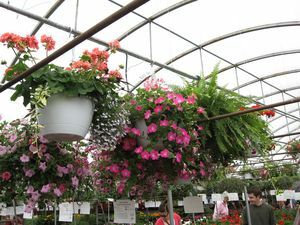 Milmont Garden Center has a variety of flowering hanging baskets and combination baskets. The following Flowering Hanging Baskets are available at Milmont and are listed in alphabetical order. Due to our continuously changing inventory, you may wish to call us at (540) 943-8408 or e-mail milmont@milmont.com to ensure availability and to check prices. The Item # is included for your convenience. Most of the hanging baskets on this list are Annuals, although some may also be found under the Perennials category (such as geraniums). Others, such as the tropical Mandevilla, are considered "tender perennials" and do not weather the cold or drought. To make them last for more than a year, bring them inside during colder weather and be sure to keep them watered. For more information about making your hanging plants last, see a Milmont representative.